Sometimes I get a hankering for a good-ol’ baked potato in the middle of summertime heat. A 400-degree oven for an hour during a Louisiana summer does not a happy kitchen make. Ah! 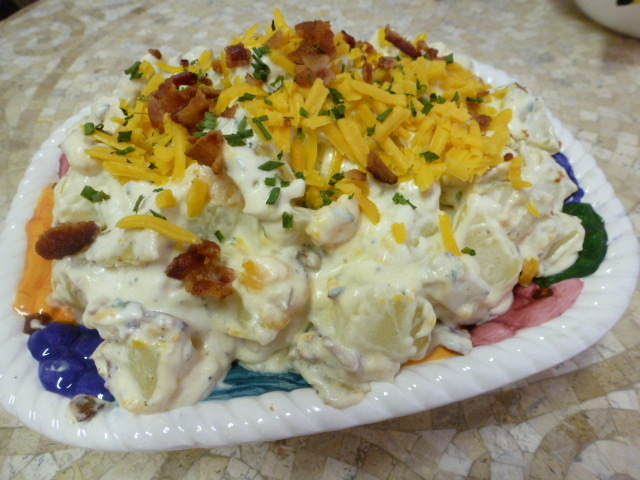 Have no fear, Gentle Readers – Baked Potato Salad to the rescue! The name is deceptive because the potatoes are not baked, but steamed – but they taste baked based on all the good stuff we will throw into the mix. Remember MawMaw’s rule of thumb: Use whatever you have on hand. I like Idaho baking potatoes, but if I have red or yellow potatoes in the pantry, I just use those. Don’t have bacon? Use imitation bacon or ham. You get the idea. Wash, dice, and steam the potatoes until done (6-10 minutes). 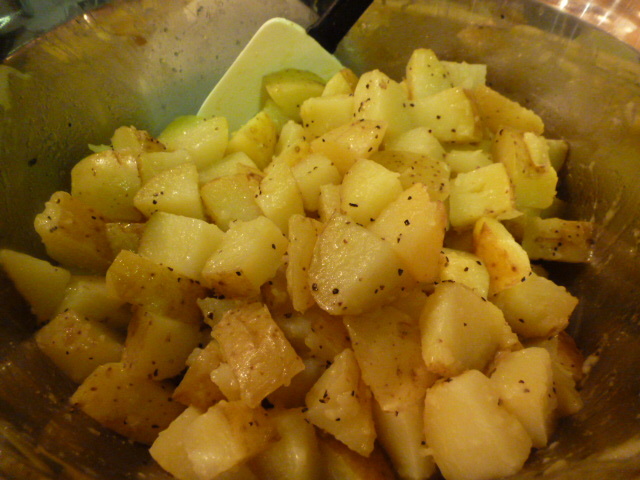 Add the butter, salt, and pepper, and fold the potatoes until the butter is melted. 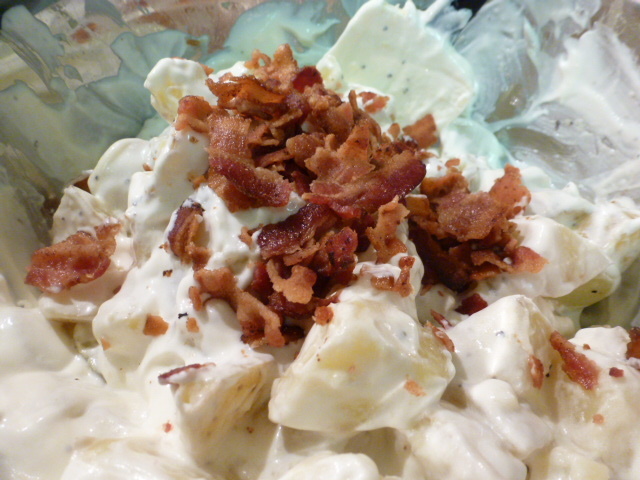 Add the sour cream and bacon; mix. Add the cheese and chives; mix. Garnish with cheese, bacon, and chives. This makes a great summer side dish to boiled seafood, grilled steaks, broiled fish – you name it! Something you can do with leftovers: Add a little bit of milk and mash to make baked mashed potatoes. 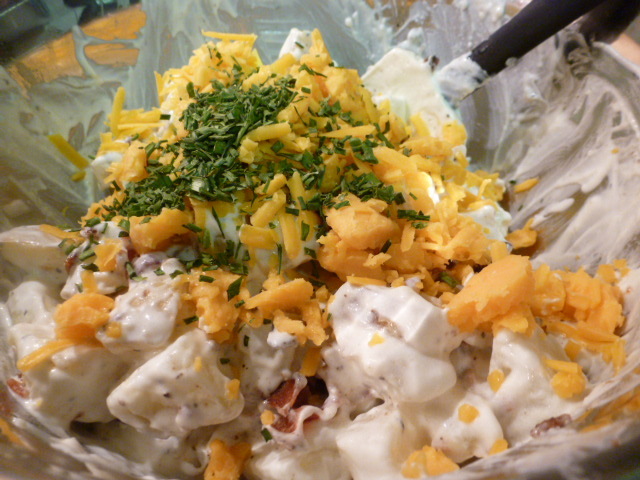 Of course, I had to run immediately over to your blog Stacy and drool over the baked potato salad. I mean “steamed” potato salad. It looks delicious, although I would probably leave out the bacon. Thanks for reading my blog, or not reading my blog, since I am going awol for a while. Awww thank you, Stacy Lyn. I just explained it all on my bat post today. (A bat came to supper.) If I make that potato salad, six bats might come to dinner. Nice quick idea. Thanks for sharing. Looks delicious. I don’t think I’ve ever made steamed potatoes.